Your Wedding Day Should Be Exciting & Fun! Don't be overwhelmed by the process. 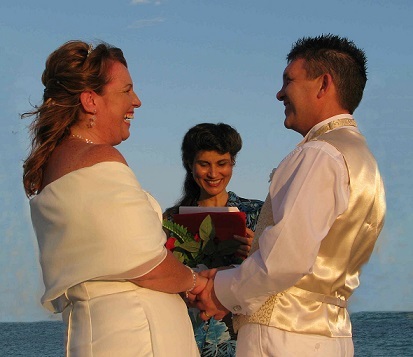 We specialize in small, convenient, romantic tropical beach marriage ceremonies, vow renewals & commitment ceremonies. Celebrate your wedding day in style. Have your nuptials in a natural, stress-free, exotic location: by the ocean on Miami Beach! From South Beach to Sunny Isles, it's the perfect setting for your tropical beach wedding!! This romantic, casual & carefree beach wedding ceremony package is the perfect way to say "I Do"! This package is for Florida residents & non-Florida residents who will be Applying for a Marriage License in Person. This all-inclusive deluxe beach wedding ceremony package includes a Florida Marriage License by Mail. This package is for non-Florida residents (U.S. & International) who want the paperwork prepared and get their marriage license before they arrive to South Florida. This special beach ceremony package is the perfect choice for couples who want to affirm (or reaffirm) their love for each other with a romantic union celebration. No marriage license is required for commitment ceremonies or vow renewals. This service is for out-of-state & out-of-county couples (U.S. & International), who will be getting married in Florida, and want to get their marriage license taken care of before they arrive. ONLY non-Florida residents (U.S. & International) are eligible for this service. Payment for this service is due 6 weeks before your wedding date for U.S. couples (8 weeks before wedding date for International couples). Processing time for this service is 4-6 weeks for U.S. couples (6-8 weeks for International couples). Your wedding day photos will be professional quality digital shots on a Photo DVD of your ceremony from beginning to end. We take pictures before, during and after the ceremony. We mail your Photo DVD to your home address, which should arrive in about 2-4 weeks for U.S. couples (4-6 weeks for International couples). The State of Florida will mail you a Certified Copy of your Marriage License, which should arrive in about 2-4 weeks for U.S. couples (4-6 weeks for International couples). Your Champagne Gift Basket, Decorative Copy of your Customized Vows & Keepsake Certificate of Marriage (Commitment or Vow Renewal) will be handed to you after your ceremony is performed. All packages & services payable by Credit Card, Debit Card, or e-Check through PayPal. All packages require a $200.00 non-refundable deposit to reserve your ceremony day & time. Florida Marriage License by Mail fee is due 6 weeks before your wedding date for U.S. couples (8 weeks before your wedding date for International couples). If wedding date is less than 6 weeks away (8 weeks for International couples) then this fee is due at the time deposit is made. The remaining balance on your package is due 2 weeks before your ceremony date. If wedding date is less than 2 weeks away, then we require payment in full (deposit and balance). Weekend & Holiday Surcharge - All packages require an extra $200.00 surcharge for ceremony dates that fall on a Friday, Saturday, Sunday, or Holiday. Guest Surcharge - All packages include 4 guests. Cancellation Policy - If you cancel your ceremony less than 2 weeks from your ceremony date, we will give you a 50% refund (excluding the non-refundable deposit and Florida Marriage License by Mail fee). If you cancel your ceremony within 7 days of your ceremony date, no refund will be made. Our Silk Loaner Bridal Bouquet (that we lend you to use during the ceremony) must be returned after the ceremony. All packages are complete as stated above - no substitutes or "a la carte" items, and no discounts for omitted items. By making a deposit to reserve your ceremony date, you agree to these terms & conditions.